Diary of a Sewing Fanatic: Stripes can be border prints too! Well at least in the Fabric Mart universe they can be! I bought this fabric from FM after #carriagecornersewcamp last March. It wasn't on the site when we were there but it caught the eagle eye of Nakisha from Dressmaking Debacles at the time and she let us know when it appeared on the site. She made an amazing shirt from it. I bought some too but it sat during the summer while I made other things. For some reason I didn't take a picture of this fabric before I washed or cut it apart to make my shirt. Though Nakisha's version is a true representation of how the fabric is made and shows the stripes much better than my pics do. As I said my fabric was cut apart to work with the border print. This is the most conservative version of my Border Print shirts. There are no real construction changes to this shirt. I used the straight hem version of my TNT pattern. 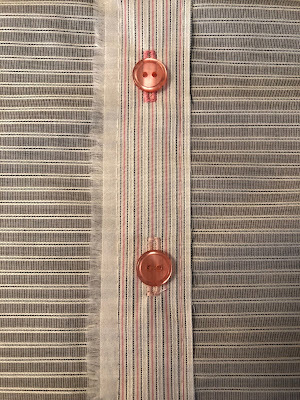 Cutting apart the border and using it to cut out the buttonbands, cuffs, collar and collarband is what makes this shirt work. 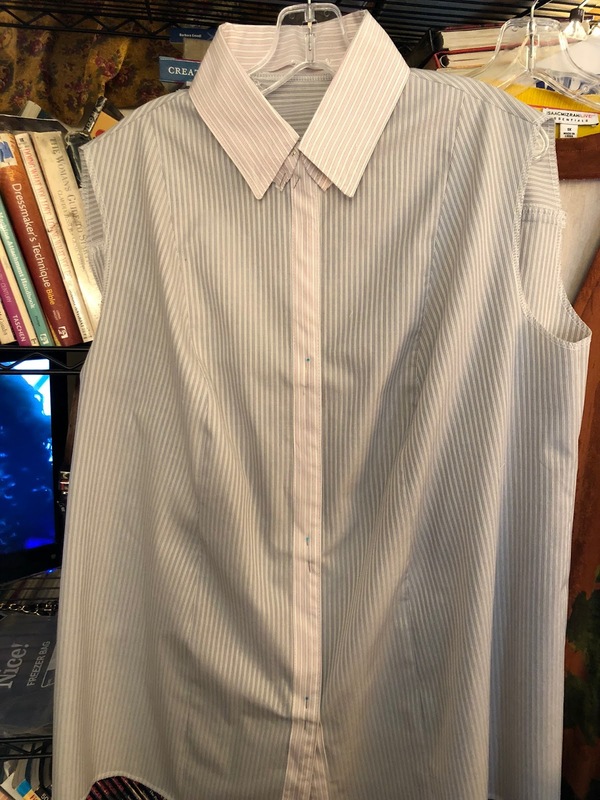 I added a strip of the pink stripes to carry the border print throughout the garment since I didn't have enough fabric to cut the cuffs out of it. I included a few construction photos so you could see the stripes and how the border print was used. Especially since the stripes seem to be washed out in my final pictures. I know I probably should have retaken them but honestly this was garment number six that I'd photographed and at that point I was done. I'm sure y'all will get the gist of my shirt. 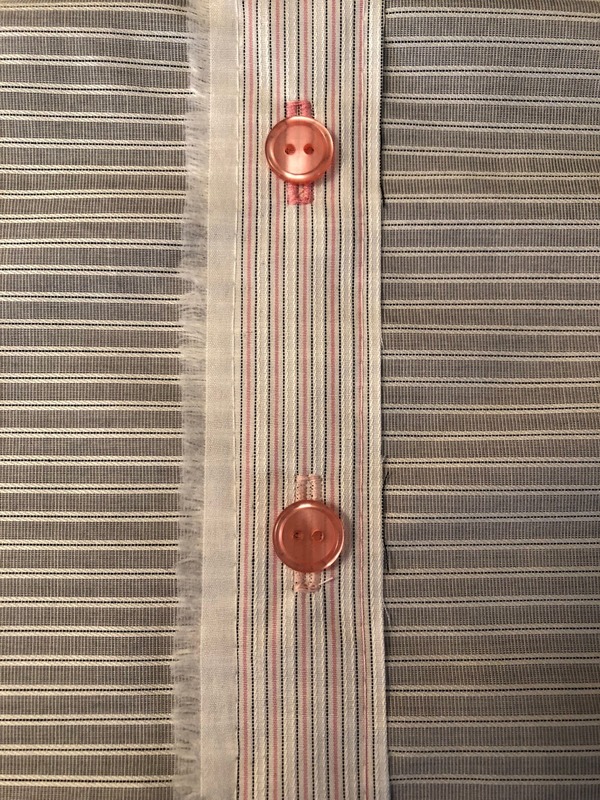 This was a unique piece of shirting and the striped border was very small compared to the rest of the fabric. However, there was enough to add contrast to the shirt, so that's how I used it. This is the last shirt in "The Border Print Series" and I'm glad I concluded it by using a more classic-type shirt fabric. It was shirt Number 16 for 2018 and my last garment for the year. This also catches me up on blogging about last years garments. I have a few remaining pieces from January that will also show up in February. Anne - there’s a “shirts” tab in my sidebar. Click on that and scroll through the posts. My pattern alterations are scattered throughout the posts. Additional from Anne: what I failed to say properly, is that this shirt looks nice on you! Love this on you, Carolyn! Love how you used the stripes! I like bias stripes on the cuffs also. Great looking and fitting shirt! perfect fit Carolyn, I have enjoyed all your shirt posts. People who are not standard size (I used to be) really need to learn sewing or they are just doomed to wear ill fitting clothing. I have not yet figured out how to style and fit my 38DD waist 38 body. Maybe you have a suggestion as to what pattern designer would work best. I would definitely try the Harrison Shirt by Cashmerette Patterns. If I hadn't already started my shirt journey with Butterick 5678, that's what I would use. It has the full bust adjustment done already, it comes in cup sizes, and there is some shaping in the front for the fuller bust. Beautiful workmanship as always. The subtle difference in the border and your use of it make a world of difference in how classy this shirt looks. Well done! K - thanks! I'm jealous that you have 2 more yards of this! I had scraps left after cutting mine out. I thought the border was larger than it was so that was some careful cutting to get my shirt. I love the detail shots of this top. Such a cool use of the stripe. And it looks great on you! This reminded me of an interesting use of the selvage edge I saw in a restaurant a few months ago. A young lady had used the selvage from a lightweight denim as trim on the arm bands on the sleeves of her dress. In fact she and her group of friends all had variations of the same dress (I believe they were either Amish or Mennonite) and the interpretation of the same pattern with different fabric manipulation and trims meant you really had to closely look to see that they were, in fact, the same overall pattern. I think I embarrassed her or she was shy, or I was gauche and disrespectful, honestly I'm overly friendly sometimes so it could be all of the above! LOL! BUT-I really admired the use of the sometimes very pretty part of a fabric that doesn't always get used.